PROOF: After hearing a scr From the New York Times bestselling author of Whistling in the Dark comes an unforgettable novel that illuminates the sweet and brittle bonds of family, the tenderness of growing up, the heartbreak of longing for what we’ve lost, and the poignancy of finding love. To ask other readers questions about The Mutual Admiration Society, please sign up. I'm a little confused: is this book part of a series that includes The Undertaking of Tess and The Ressurection of Tess Blessing? If so, do you recommend reading them in the order in which they were published? To confuse matters, the timelines of the first two seem to be chronologically reversed, and appear overlap events in this one. Any guidance? Yup, this is my book and I gave it five stars because I'd have to be kind of a dope to work on a story for year and a half if I wasn't in love with it, right? There'll be a giveaway here at Goodreads as we draw closer to the release date, so be sure to visit often. Wishing you all the happiest of holidays! Hugs, Lesley. When I saw this book by Lesley Kagen on Netgalley, I jumped at the chance to read it! I read her book, "Whistling in the dark" (which I just loved) and the sequel, "Good Graces" which was very good too. I love the nostalgia of stories set in the 1950's/60's. Add two elementary sisters running around a neighbourhood trying to solve a so-called "murder" and causing a bit of mayhem and I'm hooked! The author does a good job with her research and I enjoyed Tess' cute 50's "talk." This book just didn' When I saw this book by Lesley Kagen on Netgalley, I jumped at the chance to read it! I read her book, "Whistling in the dark" (which I just loved) and the sequel, "Good Graces" which was very good too. I love the nostalgia of stories set in the 1950's/60's. Add two elementary sisters running around a neighbourhood trying to solve a so-called "murder" and causing a bit of mayhem and I'm hooked! The author does a good job with her research and I enjoyed Tess' cute 50's "talk." This book just didn't entice me like her others did. It was a bit slow to start but by the middle I was enjoying it. It's still a cute, fun story that takes you back to a time when things seemed less complicated and at times more tranquil. Thank-you to Lake Union Publishing and NetGalley for allowing me the opportunity to read this Advanced Reader's Edition. This was such good fun to listen to. Tessie is a fun, adorable and quirky young girl. She had me smiling throughout this story. Although somewhat emotional in places, this is an overall funny feel good story, and definitely one I'd recommend if you enjoy a cosy mystery with a pair of entertaining sisters to keep you amused. I borrowed this in audiobook format through Kindle Unlimited. THE MUTUAL ADMIRATION SOCIETY is a unique coming-of-age story filled with sister-promises, ‘sure signs of loony’, and amateur sleuthing. And the characters stole my heart from page one. Tess, Bird, and Charlie, three kids who have navigated such tragedy in their short lives, are a triumvirate of quirky wonders. I loved them and their view of the adult world. Bravo, Ms. Kagen! Lesley Kagan does it again! I loved The Mutual Admiration Society. Funny and heartwarming, this novel has it all. Move over Flavia de Luce...there's a new kid in town! Theresa "Tessie" Finley is the President of the Mutual Admiration Society, an aspiring detective and blackmailing agency. She is also a little girl with an awful lot on her mind. Since the death of their father, caring for her "sweet, weird" sister, Birdie, requires a great deal of attention, as does keeping on the good side of their neglectful, emotionally distant mother. After witnessing mysterious events in the local cemetery late one night Move over Flavia de Luce...there's a new kid in town! Theresa "Tessie" Finley is the President of the Mutual Admiration Society, an aspiring detective and blackmailing agency. She is also a little girl with an awful lot on her mind. Since the death of their father, caring for her "sweet, weird" sister, Birdie, requires a great deal of attention, as does keeping on the good side of their neglectful, emotionally distant mother. After witnessing mysterious events in the local cemetery late one night, Tessie learns that one of her many enemies, school principal, Sister Margaret Mary has gone missing. Now she has another item on her already full To-Do List--find the suspected abductor of the nun. The cards seem stacked against the sisters as they begin their investigation. Will their snooping alert their nosy, interfering neighbor...or worse, draw the attention of a kidnapper/murderer? Always a bit leery of the kindle firsts. My experience is that they are rated higher than they should be because people do t expect as much from a book they don't have to pay for. Most of them I have hated. I didn't hate this book but I didn't love it either. The narration, the voice of a young, imaginative girl, got to be a bit much. But it was original and consistent. The circumstances of her life are pretty tough but she seems pretty unsinkable. I guess I didn't like all th Kindle first book. I guess I didn't like all the really dark side stories that are treated so lightly as a result of the narration style. I did a fair amount of skimming when she got repetitive. Two little sisters are on the hunt for the (possible) murder of a nun in a cemetery. Sounds cute doesn't it? Well, it did to me. However, I found the girls spending more time running through the cemetery, hiding from the nosy neighbor, and eating. Little girls usually aren't so dull. They just didn't capture my heart. All of Kagen's books are gems and her latest is particularly bright. I laughed and wiped away more than a few tears as eleven year old Tessie navigated adolescence, family loss and a murder mystery in her 1950s small town. Bravo! Thank you to Lake Union Publishing and the author for the opportunity to read an ARC of this entertaining book. I've read several books by Lesley Kagen, and if you loved Whistling in the Dark and Good Graces, you will thoroughly enjoy this upcoming release of hers. The story is told from preteen Tess Finley's POV. This spirited, witty, imaginative girl, and her side-kick, younger sister Birdie, take the reader on a possible-murder-mystery sleuth adventure. Her "gumshoe-detective" ways, and her "no Thank you to Lake Union Publishing and the author for the opportunity to read an ARC of this entertaining book. The story is told from preteen Tess Finley's POV. This spirited, witty, imaginative girl, and her side-kick, younger sister Birdie, take the reader on a possible-murder-mystery sleuth adventure. Her "gumshoe-detective" ways, and her "now just wait a cotton-pickin-minute" talk will take you on a trip down memory lane of what life was like decades ago. The author's "voice" in this story, as with some of Lesley's others, reflects life from the late 1950's. Even though the story takes place in Milwaukee, Tess knows her neighbors and the neighborhood gives you a feel for small-town life, where everyone looks out for each other. This is a fun book, but the main character's sides were distracting and made a short story into a novel. I would recommend this book for anyone who likes an easy read, as long as editing problems do not concern them. This one was jut a little too saccharine for me. The protagonist's precociousness was amusing, but it was just a little bit too much. Tessie's narrative grated on my nerves-too much! What was cute in small doses became obnoxious. ** and her imagination which is running rampant in the direction of becoming a sleuth. She has an on-again, off-again relationship with God; a shaky relationship with the neighbor, Mrs. Gertrude B. Klement, who would love to have Tessie and her ten-year-old sister Birdie sent away for their own good; and a respectful relationship with the cemetery care taker and grave digger, Mr. McGinty, who acts like a godfather to the two little girls. Milwaukee in the 1950 is their beat, and the businesses in town their juvenile delinquent territory. She was more interested in doing crimes than solving them. when I grew up I was going to keep being exactly what I already was—an eavesdropper, liar, shoplifter, cat burglar, poison-pen writer extraordinaire, and top-notch blackmailer. She learns early in life that there is always another hand to slap you around, usually about the time you're feeling like you got the world by the tail. The Mutual Admiration Society consists of the two Finley sisters and young Charlie, currently Tessie's fianceé, although he might not be aware of it. The novel is written for adults. Obviously. Unfortunately it lost me completely between the endless blabbering, the countless side stories and the jumping around between reality and day dreaming. Although it was kind of cute, and the wisecrack, witty humor delightful, it just was way too much. I struggled to the halfway mark, skipped to the end and got out of it as fast as possible. It started out being charming, then became annoying. The setting was just great. When I think Kagen cannot get any better, she goes off and writes another story that knocks my socks off. I feel I need to warn you that once you start reading you will keep reading and ignore everything and everyone around you!!! Be prepared to stay up well past your bedtimes. Now onto the review... Kagen allows us the pleasure to hang out with the Finley sisters once again and that alone makes my heart smile. Then you add in her ability to capture child-like innocence, wisdom and curiosity wit When I think Kagen cannot get any better, she goes off and writes another story that knocks my socks off. I feel I need to warn you that once you start reading you will keep reading and ignore everything and everyone around you!!! Be prepared to stay up well past your bedtimes. As an early reader, I'm thrilled to report that you're in for a treat. By turns laugh-out-loud funny and poignantly moving, the sister relationship in this novel is incredibly unique and brought more than a few tears. This might be Lesley's best yet. Brava! This was my Kindle First pick for January. I was looking for a light, warm read. However, I had a very difficult time getting into this book. While I was interested in the time period, and some of the peripheral characters were well-drawn and interesting, overall this book didn't speak to me. I think I missed a lot of the humor, which just underscores that this book and I were a bad match. This book brought back many memories of growing up in Wisconsin. Through Kagen's keen sense of humor and sensitivity, we take a loving and thoughtful step back to less tolerant times. I would recommend it to anyone. Loved this! Reminded me so much of growing up Catholic in New Orleans! Sometimes I don't know what I'm getting when I pick up a book someone else has left around. 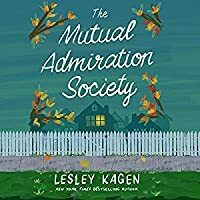 Such was the case with The Mutual Admiration Society, by Lesley Kagen, which I attempted to make into one of Alan Bradley's Flavia de Luce mysteries. They each have a tween as a protagonist, both of whom are smart and plucky. They each solve mysteries. That's about where the similarity ends. Tessie, Kagen's narrator, is a smart-talking girl whose beloved father recently drowned. She is attempting to prote Sometimes I don't know what I'm getting when I pick up a book someone else has left around. Such was the case with The Mutual Admiration Society, by Lesley Kagen, which I attempted to make into one of Alan Bradley's Flavia de Luce mysteries. They each have a tween as a protagonist, both of whom are smart and plucky. They each solve mysteries. That's about where the similarity ends. Tessie, Kagen's narrator, is a smart-talking girl whose beloved father recently drowned. She is attempting to protect her "loonie" younger sister, Birdie; save the family from losing their home; prevent her sister and herself from being sent away; and handle the normal vagaries of growing up. Writing and rewriting (entertaining) lists is one of her coping strategies. She is a smart kid, but more street smart than book smart, as she frequently misuses language in the manner that occurs when one either hears rather than reads language or when one is attempting to seem smarter than one is (e.g., "For some unknown reason, he eats locks and beagles," p. 116). She frequently jumps to conclusions before gathering all the relevant data – and is nonplussed when Birdie gets it right (more often than not). Flavia, Bradley's protagonist, is smart and privileged, and solves real murders. She has difficult relationships with her older sisters, while Tessie adores her younger sister. If you expect Mutual Admiration Society to be a mystery, especially a mystery like the Flavia de Luce series (like I did), you are likely to be disappointed. Tessie and Birdie barely leave their front porch in the first 100 pages – although she makes many wry and interesting observations about their neighbors and the world. 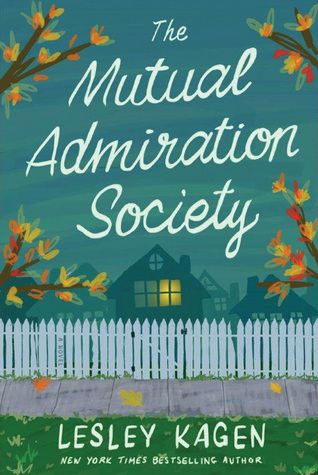 Instead, Mutual Admiration Society is a story of a different time and place (working class Milwaukee in 1959), where children were allowed to play with less supervision, and neighbors were often very involved in a child's life. This is a story that will make you smile. This was just terrific......I laughed (a lot) and cried (just once) although it is not short on some really touching moments. This is my first book by this author and it looks like Tessie's story continues in another one but it's hard to figure out which order you're supposed to read them in accordance with when they were written. Maybe she wrote a prequel long after......it's annoying when authors do this or the publisher releases them out of order. Again, very aggravating. At the beginning I wa This was just terrific......I laughed (a lot) and cried (just once) although it is not short on some really touching moments. This is my first book by this author and it looks like Tessie's story continues in another one but it's hard to figure out which order you're supposed to read them in accordance with when they were written. Maybe she wrote a prequel long after......it's annoying when authors do this or the publisher releases them out of order. Again, very aggravating. At the beginning I was irritated before I started because we trawl through 3% of the book with all this self-promotion guff. We can read reviews if we want to, they're not needed in a book by the pageful. The only mistakes I spotted throughout were a couple of missing words and that was it. Splendid !! It was a fascinating story. You just adore these kids, (and I'm not a child-lover by any stretch, trust me) Tessie especially. She's got spirit, but a really good heart and deep-down some terrific values, too. The mentions of Ed Gein and how she laughed about him did make me laugh.....though at least he wasn't giving her nightmares. This is set in 1959 and is beautifully non-PC which also made it a delight to read. Back in the days before everyone started to get offended over everything they possibly could. I almost choked at the first mention of the Pagan Baby Society, not something I've ever happened across before, I have to say. It did make me laugh.....though I looked afterwards and saw it did actually exist. This was my Kindle First Pick for January. I think this book for it's genre is very well written. Lesley Kagen writes great dialogue from a young girl's point of view. I didn't realize this was part of a series so I'm sure there were things that had more meaning if I had an opportunity to read the first book. The story is told by Tess, an eleven year old girl, who is very busy making sure her sister Robin, AKA Birdie, doesn't get into trouble. Birdie was born two months premature and has some mental issues that make her unpredictable. This is far too much responsibility for Tess but she does an admirable job keeping her sister near and safe from bullies who make fun of her. Unfortunately, Gertrude Klement the nosy next door neighbor wants the girls gone and does her best to report every wrongdoing to their mother. The family is going through difficult times due to the accidental death of the girl's father. Tess also feels guilty because she was present when this happened and she didn't do anything to help save her father. Tess is an interesting girl. She has many lists that she updates almost daily. Ways to Recognize Loony Behavior, Ways to be a Better Wife. They're all about her goals in the immediate or long-term life. The story is funny and scary and rather amazing when Tess shows what she is capable of doing with her limited resources. As the story ended I was rooting for Tess to succeed in keeping her sister safe and with her. This was a Kindle First book for me and I was really disappointed. It reminds me of when kids have all the free time of summer to investigate and play and so I thought a story about sisters trying to solve a potential kidnap/murder would be entertaining. The only entertaining are the responses the Magic 8 ball gave to Tessie's questions. I am not sure if I read the same book as the others who gave it 5 stars. For me there was too much going on inside of Tessie's head to really keep tr This was a Kindle First book for me and I was really disappointed. It reminds me of when kids have all the free time of summer to investigate and play and so I thought a story about sisters trying to solve a potential kidnap/murder would be entertaining. More about Lesley an Lesley Kagen is a mother of two, a grandmother of two, an actress, celebrated public speaker, essayist, and the award winning, New York Times bestselling author of eight novels, including her newest, THE MUTUAL ADMIRATION SOCIETY, which will be released in January 2017. She lives in a charming small town in Wisconsin in a hundred-fifty-year-old farm house with her dog, Gracie.